The Chairman, John Bloomfield reviewed the past year in which we had six talks, ranging from Richard Ward's Picture Show to Roger Kennell on what bricks can tell us. Jan Byrne has represented the Society on the Town Forum and Baberghs Traffic & Environmental Working Party. Thanks was also expressed for Graham Panton's work on the Newsletter and putting the Society on the Internet. A special tribute, in flowers, was given to Hattie Bawden who stood down after long and outstanding service on the Executive Committee, most recently as leader of the Planning Panel. 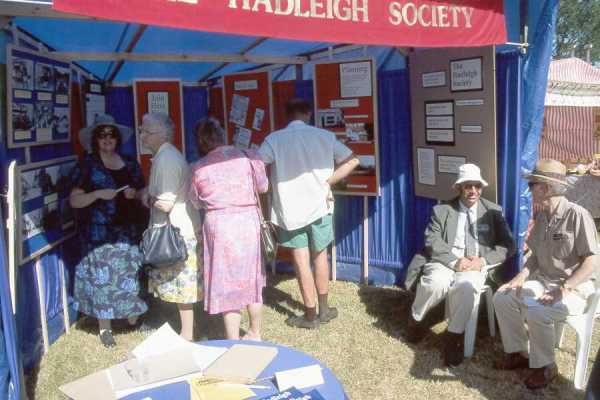 The stand at this year's Hadleigh Show was a great success in attracting interest in the Society, thanks to the hard work of the Byrnes. Rosemary Schade was welcomed as a new committee member and the Committee would also be pleased to take on more 'new blood' at any time. The History Group has been very active this year, with many members also working in the Archive Room of the Guildhall. Joe Byrne continues as chairman and Jill Sutherland as secretary. The group is hosting a meeting of the Suffolk Local History Council on Saturday 19th September and would welcome more helpers. The formal meeting was followed by a presentation by Joe Byrne on the towns Archives, illustrated with several examples of documents. Finally, Cheese and Wine were served, thanks to the work of Nora Betteridge and Hazel Woods, once again. No election was necessary and the following were duly appointed to the Executive Committee for the coming year, with a vote of thanks from our President, the Revd Canon John Griffin. The Local Government Association will be co-ordinating the Dont Choke Britain campaign, to be launched by Transport Minister Gavin Strang on 29th May. It aims to promote practical solutions to traffic congestion and to raise awareness of the dangers from traffic-related pollution. A Dont Choke Britain action pack, with advice on how to organise local initiatives, is available from the Local Government Association (Tel. 0171 664 3346). Introducing 20mph zones in order to create safer urban areas becomes easier under plans announced by the government. Until now local authorities seeking to establish such zones have had to follow a rigid procedure involving an application to the Secretary of State. This has involved costs and delays. Now councils will have greater freedom. Pedestrians should benefit from priority in residential urban areas under the scheme. Initially areas near schools will be targeted, to be followed by others where there is traffic congestion. A nationwide survey by the DETR found that pedestrian casualties had been reduced by 61 % where 20mph zones had been introduced. Child cyclist casualties had fallen by 67%. A Civic Trust study A New Framework for Freight Transport suggested changes that would lead to more area-based distribution of goods, shorter journey lengths, and a fall in the total of heavy lorry traffic. Long hauls have been substituted for shorter ones in recent years, with goods taking a less direct route to the customer than they used to do. Heavy vehicles contribute disproportionately to congestion and pollution. The Trusts proposals for more rational road freight management would cut environmental damage and also make it easier to achieve a massive revival of rail freight. Copies of the survey document are available from Saskia Hallam at the Civic Trust (Tel. 0171 921 0180). How can the broad aims of sustainable development be incorporated within the planning system? This is one of the questions posed in the governments consultation exercise on the theme of how we can all make Britain greener. It covers a wide range of issues. Some, such as transport and waste policy, are also the subject of separate consultations One of the aims of the wider exercise is to put these in context and explore sustainable development as a whole. The Deputy Prime Minister John Prescott says that wherever possible recycled land in urban areas should be built on first, provided it can be linked to public transport, jobs, shops and other facilities. This mirrors the sequential test introduced in PPG6 for larger retail schemes, designed to boost town centres and curb the trend to out-of-town developments. The aim is for 60% of new houses to be built on recycled land over the next 1 0 years, There will be regional variations for the brownfield targets, which will draw on local knowledge of what is available. The Civic Trust has played a leading role in advocating a tax on greenfield development, with the proceeds earmarked for brownfield schemes that boost urban regeneration. John Prescott says that this needs further debate and is a matter for the Chancellor. Many believe that a fiscal measure of this sort is needed to back up new planning guidance and create a more level playing field in the housing market. The Civic Trust and others have suggested that thousands of brownfield sites are currently dormant and that the true number is higher than that on which government planning has been based. Some experts believe that enough brownfield land exists to accommodate most of the new houses to be built up to 2016. These sites have been overlooked partly because of the perception that it is currently cheaper to develop on greenfield land. It is widely accepted that the level of new housing requirement comes, not from a higher population or immigration, but from demographic changes such as people living longer, young people leaving home to set up on their own, or the breakdown of marriages. (One commentator has pointed out that the official projections appear to assume that all those who divorce or separate from partners will live alone for the rest of their lives!) These factors suggest a pattern of housing provision that is different from the standard suburban estate of 3 bedroom semi-detached houses with gardens. Given the right policy framework they could help realise aspirations for higher density developments revitalising run-down areas. The debate about the grand total has yet to take off. The overall figure for the nations new housing requirement between 1996 and 2016 remains for the time being 4.4 million, Discussion has centred on the proportion of brownfield development and few have questioned the total. As the National Councils Factfile No. 2 suggests, the science behind the calculations is far from precise. There is still confusion between housing need, demand and the developers targets, all blurred by the official concept of the requirement. Figures for previous periods have turned out to be underestimates, but this of itself does not resolve the ambiguity that still surrounds the key concepts. According to the DETR Housebuilding Bulletin, total starts on house building were 172,800 last year. This years total is put at 190,000. Both figures fall short of the 230,000 needed annually if the demand for 4.4 million houses by 2016 is to be met. John Prescott has said We dont believe that the patterns of the past should automatically set future housing provision. We believe changes in policy can and will make a difference'. What will the requirement be for the period after 2016? Will there be so many brownfield sites left by then? In the longer term sustainability - the overriding requirement -may mean more radical thinking about this issue, with the limits of environmental capacity and peoples needs reconciled through a degree of demand management that has so far not been considered. Planning for the communities of the future (price �5.65) is available from the Department of the Environment, Transport and the Regions (Tel 0171 873 0011). An estimated �60 million a year is spent on buying and planting amenity trees, and vet many fail to survive after planting. Estimates vary from 50 per cent of standard trees dying in urban areas to 39 per cent of all planted trees dying in their first five years. Poor handling during lifting and transplanting can cause damage to young trees, which seriously impairs survival and performance. While it is commonly accepted that the best time to plant trees is when they are dormant, new research from the Forestry Commission shows that their resistance to stress varies during the dormant season. We live in an age of acronyms, most of them hard to remember and harder still to understand. One of the simplest, however, is "LOTS" - Living Over the Shop. The organisation promoting such accommodation is campaigning nationally for 500,000 homes to be created from vacant premises over shops. Surely a welcome drive which would bring life and customers into town centres and perhaps save more greenfield sites. Ipswich was one of the first towns to take up the idea and we would have had substantially more such accommodation if central Government hadnt cut off the grants a few years ago. Wolseys Gate has been a diminishing asset for years. It used to be thought of as one of the most precious landmarks of Ipswich. But theres been little pleasure to go and see it, isolated as it is by fast-moving heavy traffic and its brick and stone have been worn down by pollution and vibration. However, restored discreetly last year with grant aid from English Heritage, its in a much better state now. Bank Holiday Monday, 31st August at 2pm. Roger Kennell gave an interesting illustrated talk to the Society members on The 28th April. Bricks have a long history of use and remarkably, they are still today the basic component for building work. Evidence of this can be seen with the current developments in Station road, while at nearby Polstead Church in the nave arcades, there can be seen the earliest English made bricks, which date from 1160. Little Wenham Hall also nearby has late 13th. Century brickwork. Colchester, from an even earlier date, displays copious examples of Roman made bricks, and some of these have been reused, often more than once. Colour slides illustrated the various uses and details of bricks through the centuries, and some visible effects of the brick making process. For instance, those bricks which before they had been burnt, had been used for tally marks, and which recorded in thousands, the number of bricks made by the brick maker. Sometimes, later the bricklayer would lay these bricks with the finger tip markings showing in the wall. Members were set the task to try to find a brick which had ten marks showing, in Hadleigh, as to date, numbers from one to nine had only been found, although there were examples elsewhere. The audience was challenged to identify some typical brick bonds, but was spared the complexities of the more unusual, such as St. Andrews Cross Bond and Chinese Bond. There followed a light hearted conclusion with a series of slides showing different aspects of brick, from The Brickmaker's Arms public house sign, a village bricklayers tomb stone, of Robert Lock who died in 1873, and which showed his tools, to the builder's name board outside a property which stated: A. Brick, the Builder! Those present certainly would now be looking at the brickwork around them in a new light, and would perhaps be alerted on some future occasion to protect the great architectural building heritage which Hadleigh contains and avoid such horrendous repair work as had been carried out in the High Street. Replacing our previously advertised programme, Sue Andrews will entertain us with some historical titbits from along the length of the Brett Valley. Come and hear her at Hadleigh Old Town Hall on Tuesday 11th August at 8pm. Jan and Joe Byrne attended the Societies Day at Mendlesham. Sue Andrews was one of the "15-minute" speakers in the morning. 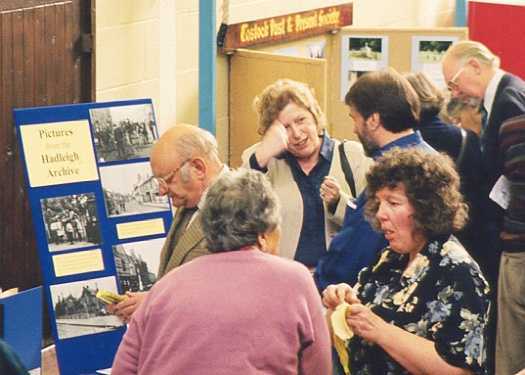 Over the lunch hour they set up a display about the Hadleigh Guildhall and Archive, then spent an interesting afternoon talking to people about the work going on in Hadleigh. 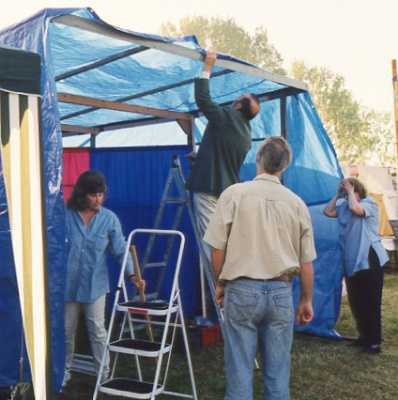 This year we decided to have our own stand at the May show and a working party met weekly through April and May whilst a stand grew in the Byrnes garden and displays were created for the inside. 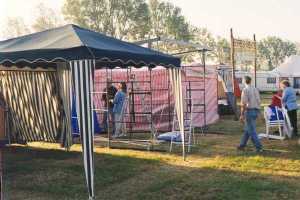 Four oclock on the Friday afternoon saw the team erecting the scaffolding based shell on the show ground, ready for an early start the next morning. Six in the morning and a fine start to the day as the display takes shape. 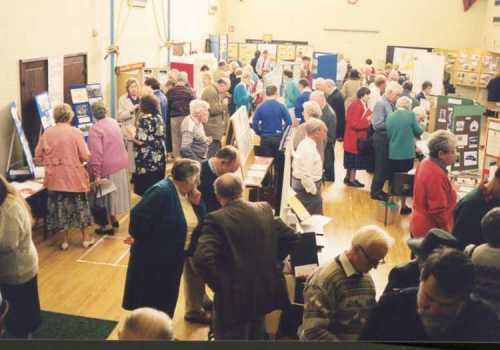 All the effort was rewarded as a sunny day brought crowds to the show and many interested visitors to our stand with several new members being signed up. Despite the bad weather over twenty members joined the evening visit to the Heraldic Garden at Boxford. 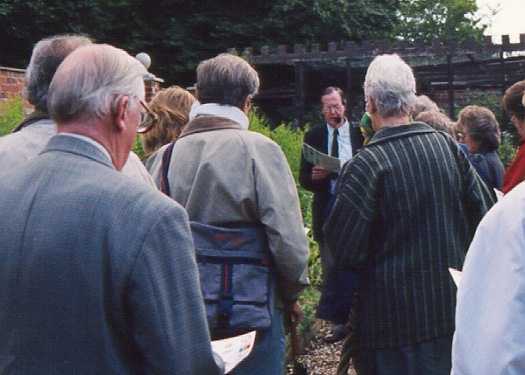 After an illustrated introduction to the origins and purposes of heraldry by Sir Conrad Swan we were taken on a tour of the garden to see how plants have often been used to introduce puns and humour into heraldry. Meet us at the Town Council offices if you want to look at the latest planning proposals. We will be there at 12 noon on following dates: 5 Aug, 2 Sep.